The Appalachian Region of the United States stands as one of the most scenic areas in North America. This 205,000 square mile region follows the Appalachian Mountains from southern New York to Northern Mississippi, including all of West Virginia and parts of Alabama, Georgia, Kentucky, Maryland, North Carolina, Ohio, Pennsylvania, South Carolina, Tennessee and Virginia. Home to more than 25 million people, this region also boasts deciduous broad-leaf trees, evergreen needle-leaf conifers and vast array of wildlife ranging from Black Bears to salamanders. For all its natural treasures however, it is home to one resource that is leading to its own destruction: Coal. We all know coal fired power plants are the one of the biggest sources of greenhouse gas but are perhaps unaware of how mining for this mineral is physically changing our landscapes. Historically, coal mining has been a major industry in West Virginia, Virginia and Kentucky. Unlike the days of yore however, no one should expect to see throngs of miners descending down a mineshaft with pick in hand today. Instead Big Coal has devised a much cheaper method of removing coal from a mountain; simply remove the mountain. 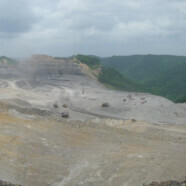 Around the 1990s a form of surface mining called Mountaintop Mining with Valley Fill operations (MTVF) became prevalent. This style of mining has been identified as “the dominant driver of land-use change in the central Appalachian ecoregion of the United States.”[i] Mountaintop mining serves to not only destroy our landscapes, but also poisons our ecosystem through its waste. What is Mountaintop Mining with Valley Fill Operations? Mountaintop mining is relatively new surface mining process whereby the top of a mountain is removed in order to recover the coal seams contained within. To do so, all upper elevation forests are cleared and remaining topsoil is stripped from the peak. Blasting holes are drilled, filled with explosives and then detonated in series. The coal is then separated from the dirt and rock by colossal earth moving equipment called draglines (which can move over 100 cubic yards of earth in a single scoop) which plows the “spoil” (the dirt and rock that made up the mountain) in adjacent river valleys and hollows. In essence, the process is exactly as it sounds: a mountaintop is removed and the adjacent valleys are filled with the spoil. While such mining tactics may seem risky, coal companies gamble that the rewards from such operations are worth it. According to the National Mining Association (NMA), mountaintop mining is a safe and economical approach to procuring coal. The environmental impacts of mountaintop removal are minimized as US law requires that each site is restored to their “approximate original contour” after the coal is removed. As the NMA claims “Each MTM site is uniquely designed, engineered, permitted, operated and reclaimed in accordance with standards that are defined and regulated under local, state and federal laws and regulations…”[ii]. They not only claim that the environmental effects are minimized, but also that these operations produce “desirable, high wage jobs that are the economic engine of local communities, states and the region in which they operate.”[iii] According to the NMA, mountaintop mining creates (directly and indirectly) 60,000 jobs for the Appalachian region. While Big Coal claims that mountaintop mining is safe, economical and restorative, the reality of this process paints an entirely different picture. First, by clearing mountains and adjacent areas of trees and topsoil, coal companies are dramatically changing the topographical profile of the area. By undermining these previously stable areas, mining regions become more prone to flooding and landslides. Clearing trees and topsoil produces an even greater problem given that “extensive tracts of deciduous forests destroyed by MTM/VF support some of the highest biodiversity in North America, including several endangered species.”[iv] It has been estimated that as much as 1.1 million hectares of forest in the Appalachians has been lost to surface mining already; posing a significant challenge to wildlife population. The notion that these mined sites can be returned to their “approximate original contour” is also laughable. While U.S. law requires mining companies to return the “spoil” to its previous state, this is rarely achieved. As Claudia Copeland points out, “that result ordinarily cannot be accomplished with mountaintop mining because broken rock takes up more volume that did the rock prior to mining and because there are stability concerns with spoil pile.”[v] As a result, a significant portion of this “spoilage” remains in adjacent valleys. According to the Environmental Protection Agency (EPA), approximately 470 of Appalachia’s largest mountains have already been removed and whose non-coal “overburden” now buries everything in its path. It has been estimated that one single fill may be over 1,000 feet wide and over a mile long. While destroying a mountain which took eons to form may seem negative enough, the consequences are far more severe when the aquatic ecosystem is factored in. As a result of the valley fill operation, the excess “spoil” ultimately ends up burying head water streams which support not only local aquatic organisms but also “play critical roles in ecological processes such as nutrient cycling and production of organic matter for downstream food webs”[vi] . In fact, rather than carrying the necessary nutrients which sustain life, the water that does emerge from the base of these valleys often contains a variety of toxic solutes causing “increases in pH, electrical conductivity, and total dissolved solids due to elevated concentrations of sulfate (CO4), calcium, magnesium and biocarbonite ions”[vii] thereby causing permanent damage to ecosystems. Studies have suggested that when more than 5 to 10% of a watershed’s area is affected by human activity that both stream biodiversity and water quality suffer. A number of watersheds in West Virginia alone have already exceeded the 10% threshold due to surface mining. Given that as much as 2000 miles of Appalachian streams were buried between 1992-2010; the irreparable damage could be significant. Though the health of the local populace may be undermined as a result of these mining operations, they should be able to take solace in the 60,000 new jobs that these mines claim to produce. Some however have taken issue with this assertion. Robert Kennedy notes that “[w]hile production has more than doubled in 10 years, industry employment in one-tenth of it was when my father warned me about strip mining as 14-year-old boy.”[ix] This is due to the fact that blasting a mountain and utilizing massive machines to sift through the rubble for coal requires far fewer workers than a traditional underground mine (thereby creating greater profits). According to Bernhard and Palmer, “the size of the coal mining workforce has dropped precipitously in the Appalachian region, falling from 171,000 workers in 1980 to 71,000 workers in 1993 without declines in production.”[x] Yet even if these job claims were true, we have to begin asking whether job creation outweighs environmental considerations. While the US (and global) economy are certainly struggling and jobs are in high demand, it is unethical to offer up our environment as a fair trade. It is clear that the behaviour of these mining interests is unconscionable and can no longer be tolerated. It’s not enough for Big Coal to be the biggest emitter of greenhouse gases, now they must also smash our landscapes to nothingness for profit, all the while poisoning everything in their wake. We must be willing to say no. We must stand tall and united in defiance of these powerful interests. Such an idea is not impossible. It is on these very mountains that such an event once took place. For five days in 1921, 10,000 to 15,000 armed miners took to the hills of Blair Mountain in West Virginia’s Logan County and staged the largest armed insurrection in the post-civil war period in the United States. Recognizing that “unchallenged and unregulated corporate power was a form of enslavement…”[xi] these miners sought to form a union to combat the depressed wages, unsafe working conditions and debt peonage forced upon them by big coal interests. To stop the union from forming, Big Coal evicted and blacklisted miners, conducted wholesale firings, hired armed thugs to break up the unions and assassinated union leaders and supporters. The actions of Big Coal would ultimately provide the spark which would ignite the Battle of Blair Mountain. In pursuit of justice, these armed miners would fight off heavily armed police and private militia for five days, ultimately surrendering to United States Army. Once the smoke had cleared, at least 30 defenders of the mine owners and 100 miners had been killed. Many miners would be arrested and their union would flounder in the immediate aftermath. Over the long term however, their struggle would raise awareness of the appalling conditions faced by miners and would shift union tactics towards the political battleground; culminating in a labour victory with the New Deal under President Franklin Delano Roosevelt. We too now face injustice of a similar vein. Our world is being destroyed, polluted and poisoned and we are the only thing which stands in the way of total destruction. We must be willing to act. While the miners who fought on Blair Mountain are long dead, the principal of justice and solidarity which united them must live. Big Coal believes these sentiments are dead. They have now set their eyes and explosives on Blair Mountain in an effort to not only destroy a mountain but also the very memory of what can happen when people band together to challenge the powerful. This is not to suggest that we should take to the hills with weapons. More often than not, acts of violence corrupt the most noble of causes and should not be pursued. We can however give life to the principal of solidarity and pursue peaceful resistance against such injustices. We cannot count on politicians to challenge these powerful interests. Any such struggle will rely on our endeavours alone. Palmer, M.A., et. al “Mountaintop Mining Consequences.” Science Mag 327 (2010): 148-149. Evans, Sam. “Voices from the Desecrated Places: A Journey to End Mountaintop Removal Mining” Harvard Environmental Law Review 34 (2010): 521-576. Bernhardt, Emily S. And Margaret A. Palmer, “The environmental costs of mountaintop mining valley fill operation for aquatic ecosystems on the Central Appalachians.” Annals of the New York Academy of Sciences 1223 (2011): 39-57. [i] Palmer, M.A., et. al “Mountaintop Mining Consequences.” Science Mag 327 (2010): 148. [iv] Palmer, M.A., et. al “Mountaintop Mining Consequences.” Science Mag 327 (2010): 148. [vi] Palmer, M.A., et. al “Mountaintop Mining Consequences.” Science Mag 327 (2010): 148. [viii] Evans, Sam. “Voices from the Desecrated Places: A Journey to End Mountaintop Removal Mining” Harvard Environmental Law Review 34 (2010): 528. [x] Bernhardt, Emily S. And Margaret A. Palmer, “The environmental costs of mountaintop mining valley fill operation for aquatic ecosystems on the Central Appalachians.” Annals of the New York Academy of Sciences 1223 (2011): 44.